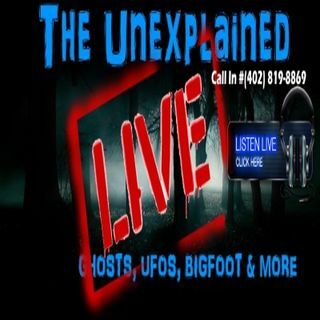 Call In # (402) 819-8869 Remember to listen to the unexplained Talk Radio for all the latest on haunted houses, haunting's, paranormal investigations, paranormal research, paranormal events, UFO's, ghosts, spirits, and more! The Unexplained is not only the premier paranormal radio show, it is also your show. Our foremost goal is to present educational and entertaining topics on paranormal events and paranormal happenings around the world as Nate & Kaleigh investigate them!, You ... See More the listener, will always be up to date on a topic that we all feel extremely passionate about. Each week, you welcome us into your life and allow us to share such exciting topics such as haunted houses, haunting's, paranormal investigations, and paranormal research. We want you to know that we appreciate you, the listener, for the time you spend with us and hope that we reach our goal of making this show a most enjoyable experience for you.